The first widespread support of federal action lowering the voting age to eighteen occurred during World War II. When President Franklin D. Roosevelt lowered the draft age from twenty to eighteen in 1942 several congressmen, lead by Harley Kilgore (D-West Virginia) proposed a voting age amendment to the Constitution. “Senator Kilgore asserted that nearly 90 percent of the approximately 7,000,000 Americans between 18 and 21 were already contributing to the war effort, either through military service or other forms of civil service. The movement adopted the phrase, ‘old enough to fight, old enough to vote’.”  To many, it seemed absurd that an 18-year-old could fight and die for his country, but was considered too young to vote. Despite endorsements from Eleanor Roosevelt and the National Education Association, wartime support for such a measure never reached fruition. A Gallup poll from January 1943 shows that only 39 percent favored reducing the voting age to eighteen, leaving a sizeable amount of Americans still opposed to the idea. Over a decade later, Dwight D. Eisenhower supported the idea of lowering the voting age in his 1954 State of the Union Message. While a proposal for an amendment reached the floor of Congress shortly thereafter, it failed to receive the necessary two-thirds majority. By the early seventies, the culture in America was ripe for change. As Amar notes, “The late 1960s and early 1970s were years of extraordinary dynamism and the Twenty-sixth Amendment was propelled forward by three of the era’s most powerful currents – the civil-rights/voting rights movement, a youth culture, and the great debate over Vietnam.” As the federal government rushed to eliminate Southern African American disenfranchisement and quell student Vietnam protest, it became evident that young adults were also restless. In 1970, six states lowered their voting rules, and for the first time, Congress revised the Voting Rights Act (originally passed in 1965) to lower the voting age to eighteen. With much debate over Vietnam, politicians hoped that lowering the voting age would provide them with a slew of votes from young voters. Despite the support of many politicians, the 1970 Voting Rights Act renewal was not the final word on the voting age. During hearings for the voting rights act, then Assistant Attorney General William Rehnquist (who would later gain fame as Chief Justice on the Supreme Court), opined that the act itself could not require states to lower their voting age, believing that only a constitutional amendment would be sufficient. That same year, Oregon challenged the act in the Supreme Court, believing Congress overstepped its authority. In the case Oregon v. Mitchell (1970) the Supreme Court ruled that while Congress could require the states to make their voting age eighteen in federal elections under the Necessary and Proper Clause, they did not have the authority to do so in state elections. After Oregon v. Mitchell states were faced with a major dilemma. They could either prepare separate ballots for state and federal elections (which would likely be a costly undertaking), or they could unify their age requirements with those related to federal elections. In addition, the baby boom generation was vocal about its desire to vote since they could already get married, have a job, pay taxes, and get drafted to military service. With large and vocal sections of the populace demanding suffrage and newly complicated voting rules, it was evident that a resolution was needed to solve the problem created by both the baby boom and the Oregon v. Mitchell ruling. 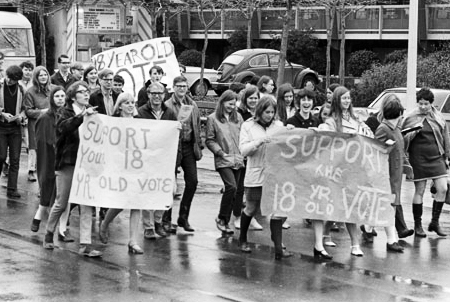 In 1971, Senator Jennings Randolph (D-West Virginia) proposed a constitutional amendment to lower the voting age to eighteen. Randolph stated young people under twenty-one, “Possess a great social conscience, are perplexed by the injustices in the world, and are anxious to rectify those ills.” While Randolph had proposed lowering the voting age eleven times before, an awareness of the contribution of young people to the Vietnam War made the nation more supportive of Randolph’s proposed Amendment. The amendment passed the Senate unanimously and subsequently passed in the House of Representatives 400 to 19. Less than one hundred days after the amendment passed both chambers of Congress, three quarters of the states ratified the Twenty-sixth Amendment, forever lowering the voting age to eighteen. The Twenty-sixth Amendment was formally added to the Constitution on July 5, 1971. This new law added the possibility of eleven million more potential voters. Approximately 5.5 million of these voters exercised their right to vote immediately in the Election of 1972, adding a sizable chunk to the voter rolls. After decades of discussion and debate, uniform rules exist regarding age eligibility voting requirements. While turnout among those ages eighteen to twenty are relatively low in the United States during recent elections, the right to vote is an important right for young adults. George C. Edwards, Martin P. Wattenberg, and Robert L. Lineberry. Government in America: People, Politics, and Policy¸13 ed. (New York: Pearson Longman, 2008), 62. Thomas H. Neal. “The Eighteen Year Old Vote: The Twenty-sixth Amendment and Subsequent Voting Rights of Newly Enfranchised Age Groups” (1983), University of North Texas Digital Library pp 1-21, http://digital.library.unt.edu/ark:/67531/metacrs8805/m1 (accessed July 8, 2013). John R. Vile, Encyclopedia of Constitutional Amendments: Proposed Amendments, and Amending Issues, 1789-2002, 2nd ed. (Santa Barbra, CA: ABC CLIO Inc., 2003), 479. Akhil Reed Amar, America’s Constitution: A Biography (New York: Random House, 2005), 445. Edwards, Wattenberg, and Lineberry, 63. This entry was posted in American Government, American History, Politics, United States Constitution and tagged 26th Amendment, American Government, American History, Constitution, History, History For Free, Twenty-sixth Amendment, United States Constituion, Voting Age. Bookmark the permalink. ← Quick Post: Happy American Independence Day!